Soo many options, where do I start? There are a few different routes you could take for your bong buying experience. You could go down Acrylic Ave. and go with a plastic piece, you could go against the grain with a wood piece, or you could join the rest of your brothers and sisters in the Glass circle. They all can take you to the moon, but there are pros and cons to each that you should know about before purchasing a new bong. 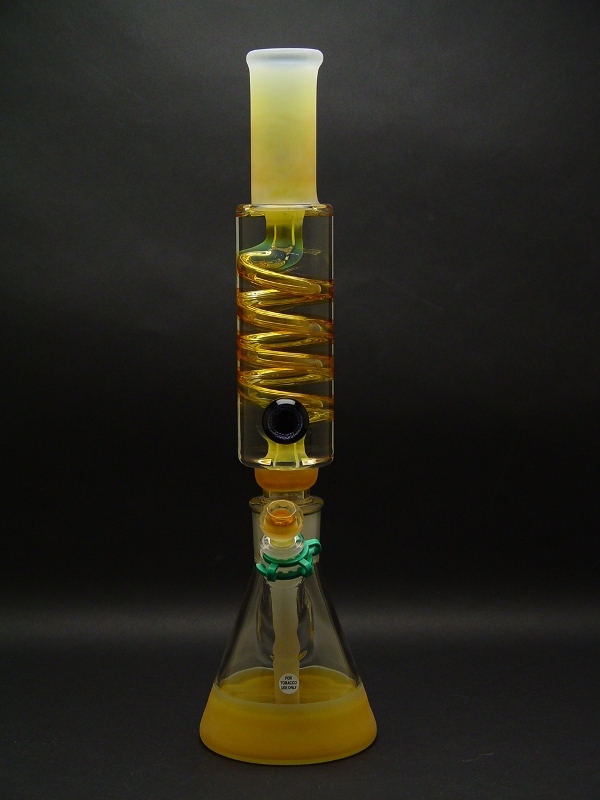 Acrylic bongs are usually found in the collection of a beginner or reckless smoker. They are made up of plastic and the down stem is usually plastic, metal, or rubber. People love these types of bongs because they are less fragile than glass and they are cheap/easily replaceable. There are a lot of things though that experienced tokers would not find ideal. For one, they are hard to clean. Most cleaning techniques you find online are for glass and will often destroy an acrylic piece. They also have a strong negative odor after only limited use. This can get you caught. You’ll also hear that the herb you smoke out of an acrylic piece has a funky taste to it, almost like you can taste the plastic in the smoke. There is also a lot of concern for inhaling harmful plastic and metal fumes. Wood bongs are very unique. They provide an earthier feel and the initial smell is great. You’ll also notice a pleasant hint of flavor in the early use of a wood piece. After a few uses, though, it gets pretty dirty and stinky. Wood is even harder to clean than acrylic too. Most wood cleaning chemicals are harmful if inhaled. They most often come with the same down stems as the acrylic pieces (plastic or rubber with a metal bowl) which brings up the harmful plastic and metal fumes you could inhale. Owning glass is standard and routine for any experienced toker. A glass bong is superior in just about every way. You can tell the quality of a glass bong based on the thickness of the glass and craftsmanship. The thicker the glass, the better. Also look for as much reinforcement as possible if there are joints (like around the percolator if you have one.) Some of the top glass brands include: Ph(x), RooR, Sheldon Black, Zob, Illadelph, Tsunami, and Zong. Beware of the fakes- if it looks too cheap to be true, if often is untrue. Glass on Glass joints (aka: a GonG) also provide a better seal than rubber seals. Rubber breaks down over time and will eventually wear and tear. Glass can last forever if you take care of it. The only cons are that glass is fragile and breaks easier than an acrylic or wood bong, and it’s more often than not more expensive than the other two examples as well. Glass bongs also have attachments you can add on, like an ash catcher or pre-cooler. The joint sizes are pretty much universal (14.4mm and 18.8mm) so almost any attachment can fit into any right-sized bong. Acrylic bongs are best for broke asses or reckless people. Although they are hard to clean, they are cheap and don’t break as easy as glass. Glass bongs are the industry standard. Although they are often priced higher, they are of higher quality and they offer way more customizable add-on options. They are also really easy to clean and last forever if taken care of. EveryPipe.com highly recommends glass over anything else.